Sometimes the designers are inspired by other designers. In this case, I was blown away by Elena Lishchenko’s layout in our color challenge this month. I was actually blown away by all of the submissions! The talent out there is unbelievable!! But how easy it is to create beauty with Lindys Stamp Gang products!! I know with every pump of the spray, or every stroke of my brush loaded with color shots or magicals, is purely magic. 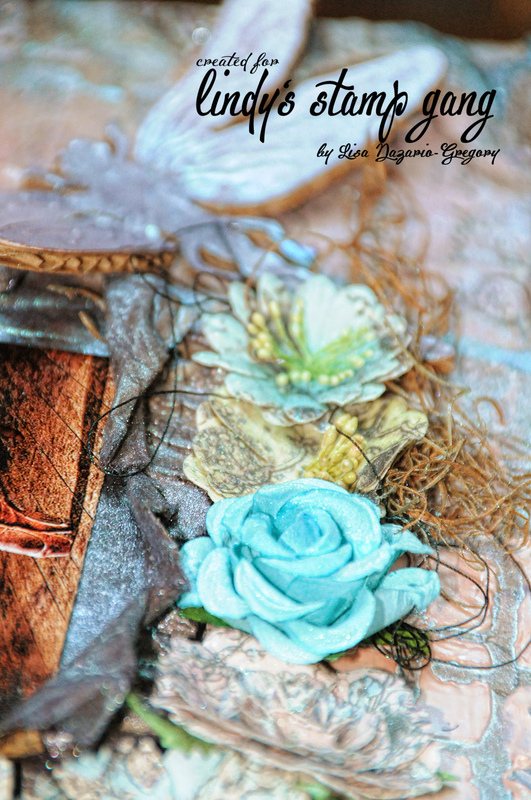 The background was created with cardboard, patterned paper, masks, texture paste and the sprays in the October 2014 Color Challenge Spray Set. 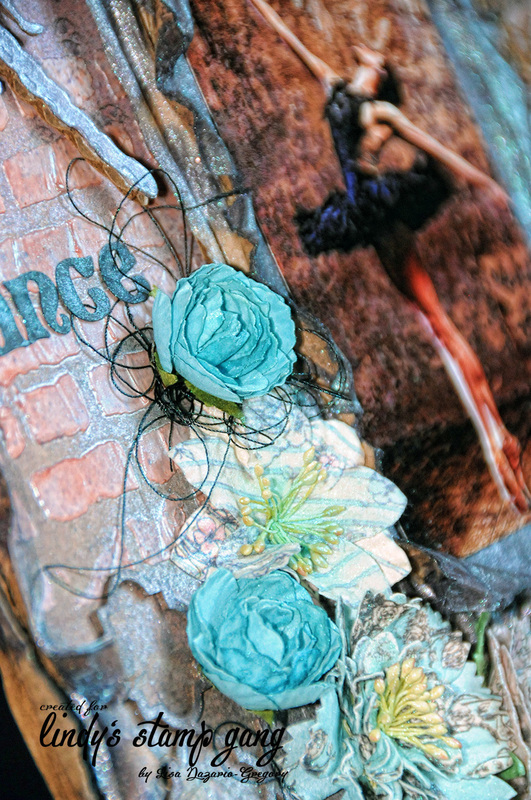 I used Tim Holtz alterations Dragonfly die. I die cut piece of corrugated cardboard with a piece of white card stock together and adhered them to one another, then just began to spray using the sprays in the October 2014 Limited Edition Spray Set. The Prima and Kaisercraft Flowers were placed on the finished layout and sprayed with Royal Peacock Fire. 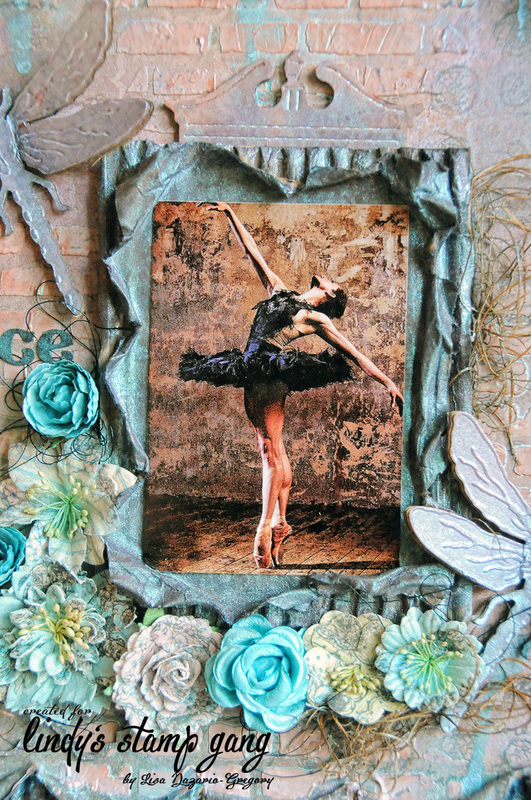 I matted the photo of ballerina Elena Glurdjidze with corrugated cardboard, tattered, wrinkled, ripped and sprayed with the sprays. The cornice on top is a Tim Holt alterations die as well. Here is closeup of the flowers. I tucked some Spanish moss and black thread under the flowers for texture. The title was die cut using QuicKutz Storybook letters from black card stock, then sprayed with Royal Peacock Fire. Thanks for stopping by and taking a peek. Don’t forget to check out the October Color Challenge!! The colors are simply divine!!! WOW, beautiful what a fabulous picture!! What a beautiful design! Nothing detracts from the ballerina, but everything adds its own little piece of magic! I really love the colours you used for this wonderful layout. Lisa, this is absolutely STUNNING! OMG! What a beautiful creation to look at! TFS such an inspirational LO!